I again took advantage of an invitation to join my friend for a couple of days at Speed Week. This started with a 6½ hour drive to his home in Brigham City on Sunday, spending a night, then driving about 3 hours to Bonneville. Taking our RoadTrek means I can at least spend the nights in comfort, which is welcome after a hot day on the salt flats. Since my friend's brother is an official, we get a few perqs, like free meals, free admission and better access to the pits. Sunday night was a big storm with wind and rain. Many spectators and participants camp on the (usually) dry mud flats a few miles before the entry. The mud flats were impossible to navigate: RVs trying to leave were soon stuck and vehicles trying to enter were stuck even worse. Those who ventured out on foot discovered the mud clumped on their shoes and the slippery conditions made walking a challenge. I noted the problems and soon located a dry spot on the shoulder of the road to park our RoadTrek. Then I caught a ride in my friend's car onto the salt flats. At the entry, we discovered a river of brine. Fortunately, the salt flats themselves absorb water quickly and the courses were in good condition. The storm delayed the start time of runs enough that we arrived from Brigham City (having left at 5:30AM) in plenty of time to do sight-seeing before Monday trials got underway. The display car at right is one of the vehicles that ran speed trials in the 1950's. Many of the present-day participants are low-budget operations and enter vehicles of similar finish quality. In the background, the Monster company provided scantily clad women to serve beverages and comfortable shade to enjoy one's drink. 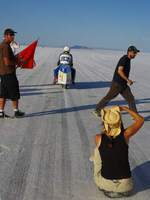 Everyone has to leave the salt flats at night and many leave their awnings and other paraphernalia set up in anticipation of an early return the following day. Sunday's wind and rain severely damaged many of the things that had been left out. Some concessions were damaged enough that they were not able to open for lunch. On Sunday the “Speed Demon” (at right) posted a record-setting “qualifying run.” Rather than go into details defining these terms, I refer the reader to last year's pages regarding Speed Week. On Monday, we watched the Speed Demon team push off the start line for a “return run.” The engine gave out before the first mile. Later in the day, the team was able to achieve a new “qualifying run” at 416MPH. There are many interesting approaches to vehicle design; it appears the driver needs a great deal of help to get into and out of the vehicle pictured at left. Most vehicles have narrow tires for lower drag: acceleration is not an issue since timing does not start until mile 1 and many do not reach top speed until the final timed segment from mile 4 to 5. The gearing is so high that most need a push to get started (as above right) and one often wonders if the engine will manage to run for the first mile. Spectators go to great lengths to make their chosen viewing spot a little slice of home. Many people choose to rent vehicles (motor homes are popular) to drive onto the salt; I assume they clean them well before returning them so the rental agency will not know how the vehicle has been used. Others have made specialized vehicles, my favorite being old school buses outfitted with shaded viewing platforms on top. Beyond the start line, spectators have to stay ¼ mile from the track; a 400MPH car goes that distance in just over 2 seconds so there is plenty of potential for a serious accident should one go wildly out of control. The distances mean a good spotting scope and telephoto lens are essential. My friend's brother announces departures on a low-power AM station so spectators down the track know when a car is coming. Behind the start line, spectators can stand next to the cars if they stay behind the yellow tape or can stand behind the cars as long as they stay behind the signs like the one at the right of the picture at left. For the streamliner cars, the restricted area is barely a car length. For motorcycles, it is close enough to feel like one is getting a vigorous TSA pat-down if the driver backs off the throttle and the exhaust blast from each cylinder starts hitting one's clothing. The smallest displacement motorcycles have record times under 90MPH, while larger displacement ones (500cc and up) often turn in speeds in excess of 200MPH. Many people have created their own vehicles to get around on the salt. 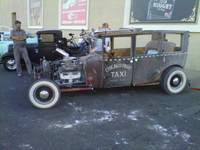 One favorite option is to outfit old cars and trucks; some are street legal while others are towed or trailered to the flats and used there exclusively. The street legal vehicles tend to congregate in a special area at the Nugget Casino in West Wendover every evening so we stopped by to see them when we went into town for dinner. Vehicles that have established a qualifying run get first priority on the track the following day to do their return run. We were at our spot by sunrise Tuesday to get set up for the 7:00AM opening. Temperatures had been in the high 90's the day before, but this morning we were wishing we had brought jackets until the sun got high enough to start warming us up. The “Speed Demon” (see above) again failed to make a return run, but later was able to make another qualifying run of over 400MPH. At left, it passes us between miles 4 and 5 at approximately 410MPH. They were able to establish a new record on Wednesday but did not achieve their goal of setting the new record to beat over 400MPH. The complete results of all runs can be found here. Vehicles in categories with records below about 150MPH often turn out before mile 4, but the higher speed vehicles go full bore to mile 4 or 5 (timing stops at mile 5). Setting up to view between miles 4 and 5 means one gets to see those vehicles when are at their maximum. That is also the place where the most spectacular mishaps occur, often when the driver lets up on the accelerator. We witnessed a number of spins, and in one case the engine burst into flames and burnt off the drag chute. No-one was injured in any of the mishaps. Most of the vehicles make their return to the pits in front of the spectators. After a long wait, we got to see the car that caught fire at close range. Our “neighbor” for the two days at Bonneville was a man from Florida who drove his custom built car all the way to this event. The English Ford body covers his home-made frame and big-block engine. There is barely enough room between the rear tires for the differential. We left the flats late enough to miss the traffic in Salt Lake City. The roads for miles in every direction were littered with clumps of salt deposited by cars and trucks leaving. The first order of business on arriving back in Brigham City: a long session in the car wash! NEXT YEAR: I was not quite accurate when I said everyone has to clear off the salt flats at 8:00PM — my friend's brother is allowed to stay overnight next to the radio equipment. Perhaps next year I will take camping gear and spend a couple of nights on the flats with my friend and his brother.